Visit extraordinary lands and make mysterious new friends. Sekiro is set in a dark fantasy reimagining of 16th century Sengoku Japan in a world of rogue warlords and embattled clans. As Sekiro—the ‘one-armed wolf’—you are on a quest to rescue your young lord from the clutches of the Ashina clan. One of its leading samurai cut off your shinobi’s arm, starting a long quest for revenge across a range of gorgeous environments. Sekiro draws strong influence from Japanese history, and from Japan’s beautiful and varied landscapes. Your journey takes you to corrupted temples in lush forests as well as towns tucked away in snowy mountains. At night you fight by torchlight in streets swarming with guards, by day you vault across rooftops and use your grapple to hop between high branches. 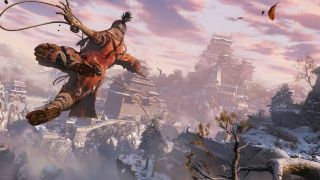 The world of Sekiro has been built with your shinobi’s grapple in mind. Expect environments with a lot of vertical intrigue, which you can exploit to get the jump on your enemies. You aren’t alone on your journey. Beleaguered merchants, mysterious vagrants, wounded soldiers, and many more mysterious characters await on your path. Some offer advice, others offer warnings. Some can be tempted back to your home temple to advise you throughout the game. Given that Sekiro is developed by the creators of Dark Souls, you can expect a whole world of enigmatic lore. This will surely not be a straightforward revenge story.